Service-learning is a teaching method that connects learning in the classroom to active participation of service to the community. Under which students learn and develop through active participation in thoughtfully organized service experiences that meet actual community needs and that are coordinated in collaboration with the school and the community. That is integrated into the student’s academic curriculum or provides structured time for a student to think, talk, or write about what the student did during the actual service activity. That provides students with opportunities to use newly acquired skills and knowledge in real life situations in their own communities. That enhances what is taught in school by extending student learning beyond the classroom and into the community and helps to foster the development of a sense of caring for others (National Community Service Act of 1990). 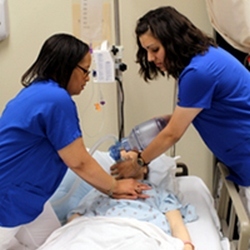 Allen College Students currently enrolled in the School of Nursing and School of Health Sciences. Engagement in the community through service-learning experiences. In the Cedar Valley Community. During the academic year, students will engage in service-learning activities within designated course. Through the service-learning activity, the student will be connected with a community partner. Better application of knowledge learned in the classroom. Development as a participating member of the community. Learn new problem solving skills. Develop a stronger connection with the academic institution. Increase likelihood of participation in volunteer activities in the future.